Sometimes the smallest clients present the biggest opportunity for creating a unique space! I’m very lucky and honored that many of my adult clients ask me to help them create equally stylish and streamlined spaces for their kids. Children’s closets present a fun challenge that allow me to really think about how the space can grow and evolve as the child does. 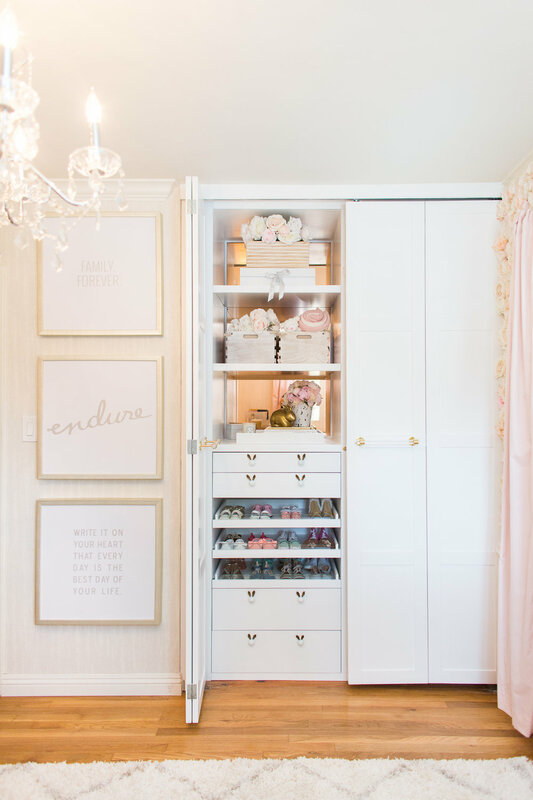 When designing for a little one, I consider storage and organization for a newborn’s nursery (check out the space I designed for Ali Fedotowsky’s baby girl! ), hanging space for a toddler’s dress up duds and easy aesthetic upgrades for youth. I recently shared some of my favorite tips and creative ways to develop a space that can grow with a child with Mansion Global and thought I’d share with you all, too. As much as you might want to deck out your child’s space in their favorite colors and patterns, remember their style, hobbies and interests will be ever-changing throughout their youth. I fully believe in letting your child discover his/her personal style by creating a space they can grow into, and decorating with more playful accessories along the way. Changing light fixtures, paint colors, and decorative hardware are less extensive and costly upgrades that will go a long way in keeping the space fresh. Empower your children by letting them be a part of these decisions, whether it’s in selecting new pieces or giving a much-needed facelift to existing furniture. As children grow, they understandably want to experiment with their room’s layout. I believe the closet should be just as flexible as the rest of the space. Do you ever see children in adult-height closets and wonder why they aren’t putting back their things? Well, no surprise...they can’t reach or don't know where items should go. It’s essential that everything -- from hang rods to shelves to storage -- can be adjusted accordingly! I love to incorporate floating shelves in a closet and on the walls around the room to provide plenty of storage space and because they can easily be moved around. They give a custom touch and are also super functional, timeless and stylish. I also like to incorporate mirror-mounted rods and hooks for a playful storage option that also makes the space feel bigger. Cabinets for hanging jewelry and accessories allow kids to see what they have and don’t take up much room! A kid’s closet should be designed with the idea that their height is going to change...constantly! So, I recommend that the hanging heights of garments, shoe shelf heights and hampers should all be easily accessible for the child. Not only will this make it easier for a child to put away his/her own belongings; it will encourage him/her to assemble looks and channel his/her individual creative spirit. Also, it’s important to note that if your child is able to dress himself/herself, then he/she can also get acquainted with the process of caring for clothes. I’m an advocate for repurposing furniture and a child’s room is a great place to experiment. Changing tables are especially versatile and can be repainted and refinished with updated decorative hardware, creating a refreshed bureau and landing space in the room. 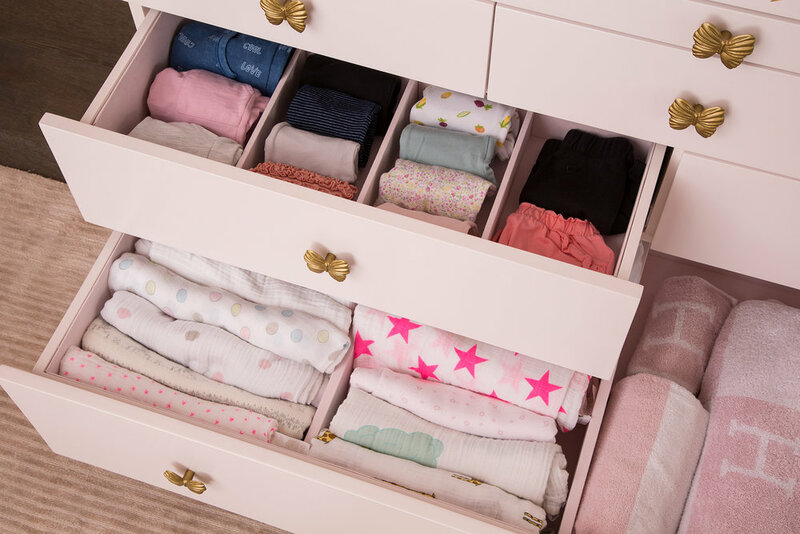 If you don’t need the drawers, these can easily be swapped for shelves, providing additional storage for books and accessories as storage needs change. Most importantly, have fun with it!